Stay current with the latest information coming out of the chemistry department. Congratulations to Alyssa DeLucia '18 on winning a Goldwater Scholarship for her paper detailing microRNA function! Dr. Pedro Bernal & Rollins student Luke Brown '17 published original research entitled "Partial Molar Volumes and Isentropic Compressions of Cyclic Ethers in Aqueous Solutions from 288.15 to 313.15 K at Atmospheric Pressure" in Journal of Solution Chemistry. Dr. Laurel Habgood, along with L. Ackermann and T.B. Gunnoe, co-edited a book entitled "Catalytic Hydroarylation of Carbon-Carbon Multiple Bonds." It is available on Amazon. Dr. Ellane Park, along with M. Kim, A. Garcia, and P. Malinowski, published "Mercury Uptake by Eastern Oysters (Crassostrea virginica) in Oyster Restoration Project of the New York Harbor" in the International Journal of Environmental Science & Technology. Dr. Kasandra Riley, along with Dr. Fiona Harper (Rollins Biology Dept.) and P. Rawson, published original research entitled "Novel species-specific glycoprotein on the surface of Mytilus edulis and M. trossulus eggs" in the journal Invertebrate Reproduction and Development. Congratulations to Rollins Alumna Shalini Allam on matching to Georgetown! A recent article features Shalini Allam '13, who will graduate with an M.D. this spring, recently matched for an internal medicine residency at Georgetown University, Washington, D.C.
Congratulations to NCAA Postgraduate Scholarship Awardee Julian Grundler '18! Rollins senior chemistry major Julian Grundler ’18 is one of just 58 fall-sports student-athletes across the U.S. to win the prestigious NCAA Postgraduate Scholarship. He will use the award when he begins his Ph.D. studies in the fall. Read more about Julian and his research advisor Dr. Park in a recent article. Congratulations to senior chemistry students! Dr. Kasandra Riley's Science of Sustenance Class will be taught in Fall 2018. Read more about the class here featured in Rollins 360. Dr. Pedro Bernal has taken part in two recent features: The Science and Culture of Chocolate & WaSH (here) and Water, Sanitation, and Health in the Dominican Republic has also been published here. Washington Post Article: Why pursuing STEM majors at liberal arts colleges is valuable? 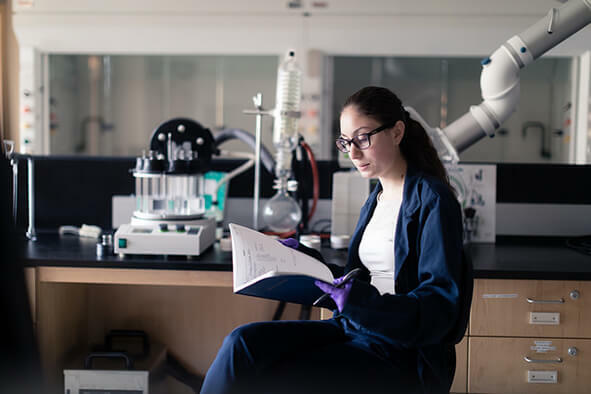 Click here to read a recent article on the Washington Post that discusses the advantages of pursuing STEM majors in a liberal arts college like Rollins!